I awoke fresh and well from a grand nights sleep in my new and fully functioning tent. The sky was full of stars at the end of a long day and we didn’t have a single drop of rain overnight to test them properly. We now have double lined tents with an outer waterproof skin and a warming inner mesh. Its true that they don’t pop up as quickly but they are obviously more comfortable and warm. I presume they will stay dry. We were gusts of the family who own Low Sizergh Barn just outside Kendal on the A591 I readied myself in the farm labourers washroom, brushed up and was once more clean. As we dropped our tents Alison arrived who co owned the family farm offering us breakfast in the farm cafe and a warm shower. We were taken to the cafe and given a huge great fry up made entirely from the produce of the farm itself. A delicious breakfast and once again we were told to put our money away. All the kinder as we had not even given a performance. There was talk of a school party visiting who we might perform to but wether the trip was cancelled or simply a figment of my imagination from past meetings no children arrived to view. We took directions from Marjory a senior partner in the family run firm and inspired by her description of the river decided that a picnic would be in order. We stocked up on fresh and wonderful treats from the Sizergh Barn shops and as advised trundling down Nannypie Lane. This was indeed a very beautiful stroll with wild flowers, scented hedgerows and wild animals darting in and out of the woodlands. We had to pull over once or twice for some rather fancy 4x4s passing but those aside we could well have been tramping in the days of Wilkinson himself. The sun shone down, the road was flat and life as a Vagabond tramp was living up to my expectations. 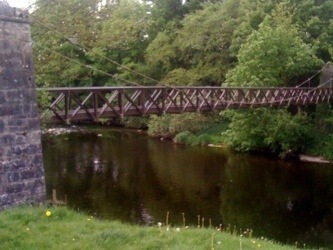 The river ran swiftly under the sprung wooden bridge that hung probably 30ft above the water. Steel cables held the frame in place and helped with the bounce that made it indeed Wibbly and Wobbly. I walked to the end of the bridge and investigated the way forward. Were it possible to transport Dolly across the bridge at all would the opposite path lead to Sedgwick? All looked well on the other side and no gates would bar our way forward and so with great trepidation we began our crossing. Dolly was built by master craftsman Luke Burges to be as light as possible and when required fit snuggly onto trains. However this bridge was tighter than any train door the studding that holds her wheels in place caught the sides. We had to haul Dolly up and over a small step before dragging her along the structure. The bridge swung and bulged as we reached the centre. Two passing ramblers stopped to watch the adventure unfold and i was quick to ask them to film what might be Dollys final journey. Lord Gregg and myself are far from the leanest of showmen and despite Master Luke‘s brilliance in constructing Dolly with a minimum tonnage our combined mass outweighed the recommended load and the bridge did moan as we struggled across. Thankfully we made it to the other side eventually free from disaster. As i type Lord Gregg is editing a short film of this episode and we will publish it during a later blog. On the eastern bank we sat by the river. Lord Gregg repaired Dollys two bursted tyres as i set our meal. Earlier we had treated ourselves to a fine collection of fresh comestibles from the Low Sizergh barn store and despite being still replete from our fine breakfast the green grass by the running water was far to picturesque to pass as a picnic site and we settled back to feast. I laid out our beef, ginger beer, oat cakes and selection of cheeses on a blanket made from my jerkin. As i unwrapped the packaging i noticed the dark clouds gathering to the south and we quickly packed once more. We shunted Dolly across the grass and towards the road in the hope of a bus shelter or similar sanctuary. A small avenue of houses led the way to the main road and the residents came out to investigate and enquire where we were to perform that evening. The storm was closing and so we were unable to offer a private performance and the locals promised to travel over to Natland for our evening show. Our local Evening Mail have been hugely supportive of the adventure so far and i’m sure our daily appearances in the paper has built a local home interest in the show. Many of the cheerful waves and toots that lift our spirits and help drive us forward are from folk who have yet to catch us Vagabonds live and many follow our story via the notices in The Mail. I had been concerned that this uplifting contact with passing folk might fade so far from home, but our appearance on the box had obviously brought our traveling show to local attention and a certain amount of curiosity even celebrity status. None the less we were now pushing Dolly in drizzle and no hiding place was to be found. The rain fell hard and suddenly we were at pace running towards the only shelter we could find a stone bridge under a railway crossing. The rain cascaded like a water fall on either side of us and we waited for a good half hour looking for a break. The tunnel floor was quickly filling as rivers ran around our feet but all to soon the sun was out once more and we were pushing onward to Natland. We arrived eventually and turned into face the pretty village green. The weather was again about to turn and we had decided to knock on the church door and ask the vicar if were welcome to rest up and eat. However as we approached the gates a funeral cavalcade arrived and we quickly slid off our hats and drifted over to a table to the opposite end of the green. For once Dolly and us Vagabonds were inappropriate visitors. The sky grew darker and the church being lost to us we were concerned. I started to think of ways we might cover up Dolly and our picnic with the blue tarpaulin we carry, but in the nick of time we were saved by a pretty Russian Ballerina who would lead us to Ray the saviour of our evening show.